How To Maximize Your Hot Tub Experience Using Ecopur Charge | Austin TX - Paradise Spas & Outdoors Living | Hot Tub Store, Swim Spas, Patio Furniture, and More! 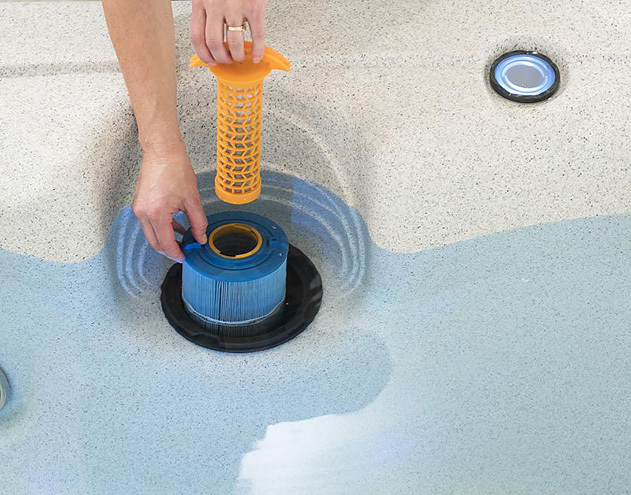 Installing a purification system in your hot tub means less maintenance and more time to relax and enjoy the restorative benefits of this luxurious product. A high-quality filter can eliminate the need for chemicals and salts that can damage the integrity of your tub not to mention your skin. How is your hot tub experience maximized when you use EcoPur? This filter alters the environment within your tub prevent contaminants such as bacteria, fungus and even algae from becoming active or thriving. Because hot tubs are warm and moist, they tend to be ideal for the growth and prosperity of contaminants such as fungus and bacteria. Chemicals and salts can be used to purify the water before and after use, however, these can damage the internal plumbing as well as cause damage to your skin over time. A high performing water filter can eliminate the time and hassle common with keeping the water in this type of luxury item clean. How does the EcoPur Charge work? This device releases zinc and copper into the water that passes through it. In high doses these metals can cause a chemical reaction within the cell of organisms such as bacteria and algae which causes them to die. Not only is this filtration process natural but it is highly effective. How do I get access to an EcoPur Charge? This product is available through a company called Master Spas. They specialize in water purification technology and have some of the most advanced designs in the market. Can I do an exchange if I own an older filter model? This product is not only available to new customers, but existing consumers can upgrade from their old systems by getting in contact with their Master Spas dealer. These dealers will walk such ones through the process of switching their filter models. Would this filter need to purchased as an additional accessory for customers? The EcoPur Charge is a standard component in all Master Spas and will be installed in all new purchases. Individuals that own spas and filters prior to the launch of this new filter are allowed to put in a request for an upgrade. Are any Master Spa filters being discontinued with the introduction of the Eco Charge? The Eco Pur inner and outer sets have been discontinued and will be replaced with the Master Spa EcoPur Charge filter. Paradise Spas and Outdoor Living is a leading distributor of premium hot tubs and swim spas by Master Spas. Less maintenance means more time to enjoy! Paradise Spas is the place to visit to find the performance and luxury in a hot tub or swim spa that you are looking for. Call us today for a Free consultation or if you are in the Austin, TX area, stop by for a visit to learn more!